Anyone who is either something of a Japanophile1 or a long-term anime fan is probably aware of the importance of the sailor uniform. The school uniforms worn by young Japanese students becomes such an important part of their identity that you can’t help but read into it and wonder what Makoto’s refusal to change says about her own sense of self. Realistically speaking, it’s probably simply a matter of Ms. Takeuchi getting tired of drawing everyone in exactly the same clothes and wanting to make Makoto stand out a bit. But seeing as that I’ve never been one to jump on the easy answer and would rather over-analyze everything, we’ll just rule that out here. As for in-universe explanations, which I prefer, the most obvious one is that Makoto is just a rebellious young girl and doesn’t feel like following stupid rules. That’s entirely possible, especially when you consider that we see her likely buying beer in the manga. 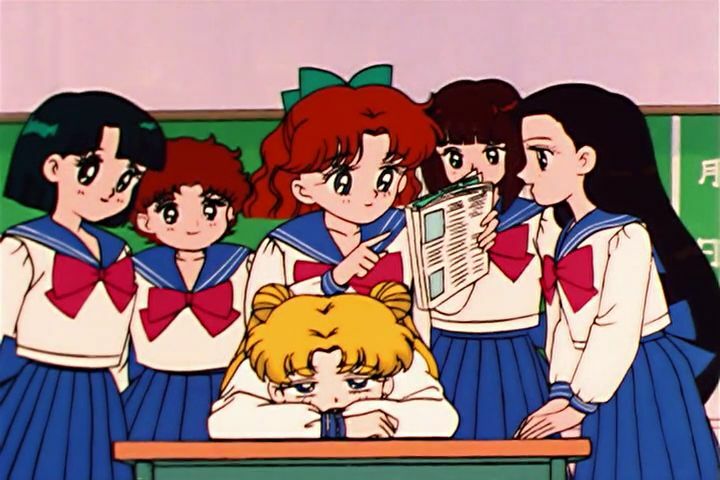 When she’s first scolded by her teacher in the manga for wearing the wrong school uniform, he also complains that her hair is permed (though Makoto insists that it’s natural).2 So she doesn’t seem to be a fan of rules in any case. Another possibility is that Makoto wasn’t lying and that, in fact, the uniforms available to students at Azabu-Juban Junior High really were too small for her. Also, in terms of height, Haruka is a fair bit taller than Makoto and Michiru is around the same height. So that means either Haruka and Michiru suffered the same fate in their previous schools, or Makoto’s height simply isn’t a factor. Lastly, and the one that I find most likely, is that Makoto simply couldn’t afford to buy a new school uniform. Sure, she lives in an apartment on her own, but she is an orphan with no clear family around to support her. 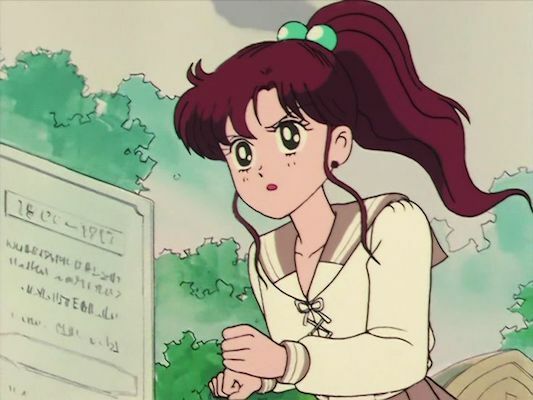 Unlike big-insurance-cash-out Mamoru, it doesn’t seem like Makoto has a lot of money to throw around. And throw around she’d have to do, if she wanted to buy a new school uniform after transferring to Azabu-Juban Junior High. Japanese school uniforms, you see, are incredibly expensive. Of course it depends on the school you’re attending, but a single public school uniform set (skirt and sailor-style top) will run you on average 31,000 yen (approx. $295 USD).34 Note that students typically need both a winter and a summer uniform — though thankfully summer uniforms tend to be a little cheaper. And let’s not even go into how much uniforms for private schools like Rei’s TA Gakuin or Mugen Gakuen cost. So it’s entirely possible that Makoto’s choice to stick with her old school uniform was, at least partially, financially motivated — which I’m pretty sure we can all agree isn’t exactly something you’d just open up and admit to people. Now that we have all that background out of the way, we can finally tackle our original question of: why the heck was Makoto allowed to wear her old uniform, anyway? Especially in cases when a student transfers into a new school in the latter half of the second year or in their third year (meaning they won’t actually get much use out of a new uniform anyway), the school may let them continue to wear the uniform from their previous school. 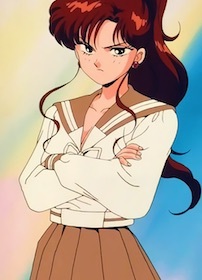 So basically, it’s entirely possible that the principal of Azabu-Juban Junior High could have made a judgement call and decided to allow Makoto to continue to wear her old uniform, especially in light of the fact that she likely doesn’t have a lot of money to throw around anyway. So who pays for this place? With all that out of the way, what do you think Makoto’s reason was for keeping her own school uniform? Nothing more than an art choice on Ms. Takeuchi’s part? Or maybe Makoto just couldn’t give up on her old flame, Freddie sempai. Let me know what you think! 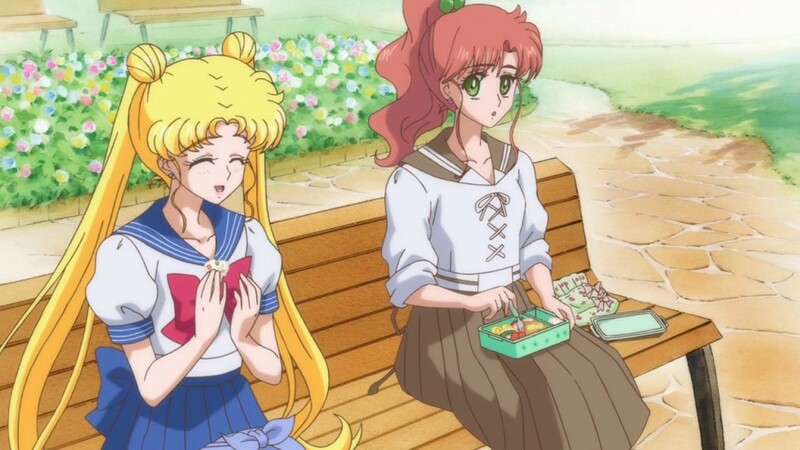 ← Was Sailor Moon One of the Most Popular Anime of the 1990s? As an old “poor scholarship student” myself, I like the financial reason. Maybe whatever source takes care of her living expenses pays the house in full, but only gives her a very modest stipend? Or maybe the house was a family property but apart from that she doesn’t have money? Same here, actually. Scholarships were really my only chance at attending school, so you definitely learned to take care of what you had! 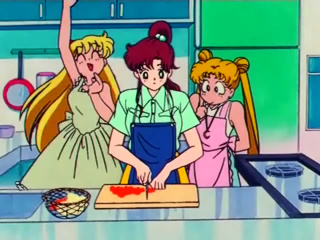 We also know that Makoto cooks all her own food, so it could be that it’s not just a hobby, but a matter of necessity. Possibly not even a matter of necessity: my understanding is that being an economic homemaker is a traditional feminine skill in Japan (I may be incorrect here), so perhaps her frugality is a point of pride and something she likes to cultivate, like gardening, cooking, etc. Also, knowing that she moved schools motivated by what must have felt to her like a strange compulsion, then trying to avoid extra expenses would have been a necessity: otherwise, her guardians/whoever-controls-her-stipend may have protested her move, and she would have no convincing reason to show for it. That is also entirely possible! I really wish that the series provided more about what went on with her family. Makoto’s situation is just so interesting! I just remembered something interesting… on the first episode of Kamen Rider Black (a 1987-1988 tokusatsu series) the protagonist finds out that his father was murdered by the evil organization of the show in an “accident”. The interesting thing is that while the protagonist is being told that, they show an image of a passenger airplane filmed from below… exactly a 747 like the one on the 1985 crash. The 1985 crash really made a huge impression! I think Mako could probably afford a new uniform, the airplane crash compensation money allows her to live more comfortably and her apartment, clothing, and food purchases make her seem well off. I think it may just be that the school year having already started may have only had an assortment of sizes that didn’t fit and the school was kind enough to allow her the option of using her previous school’s uniform rather than putting her through a wait for wearing a uniform she’ll only wear for a few semesters. The one thing that always sticks out to me is I don’t actually think Makoto has a version of her uniform with short sleeves, where as every other school uniform does have a short sleeve version for warm weather. I could be wrong and misremembering but I genuinely don’t recall her with short sleeves. I wonder if that factors into things. Depending on the school there simply may not be a shirt-sleeved version. Granted they’re high schools, not jhs, but I could instantly tell you 3 schools where the summer uniform is long-sleeved. And we live in Kyushu with its hot and super humid summers. I thought her answer “There are no uniforms in my size.” odd as you don’t buy them just in a shop but have them tailored for you. Then I thought it was quite in the beginning so it may have taken some time to make it but then everybody got so used to it that they all just left it the way it was. Now that I think of it, another reason may really be that she’s a transfer student. And it would be hard on her to fork out the money for 2 full sets of school uniforms, especially as we’re talking gimu kyouiku (mandatory education) at a public jhs which should be affordable to all kids. My daughter transferred to a public school covering class 1-9, and she and the other students may wear whatever school uniform they wore at the former school. Granted it was not a “real” school, but a semi-public pre-school but since my son transferred there in between, there were quite a few rather expensive things he didn’t need to pay but was allowed to continue using his old stuff from his former place. Furthermore at least high schools asked their graduates to leave their old uniforms behind for poorer students (or transfer students or exchange students). So Makoto could easily have meant “they = the school” instead of referring to a shop as many, including me, have thought. Then it makes totally sense that her size was not available as she is taller and possibly bigger than many other girls. And the chance that a girl her size left her old uniform to her school is minuscule. So in this case continuing to wear one’s old uniform makes perfectly sense.